STYLE GUIDE: The fantastical idea of dressing up your iPad in iconic people clothing is just absurd enough to catch on as the hottest new trend in handmade fashionable iGear. 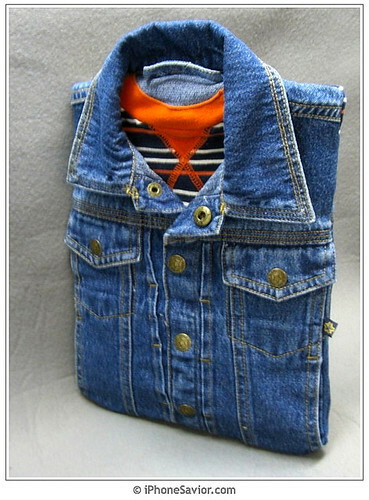 Say hello to the Jeans Jacket for iPad. This re-purposed, padded denim jacket and tee shirt doubles as an ideal secret carrying case for Apple's revolutionary device. Slip your magical iPad into back of this ultra-stylish stoner wear, then fire up the bong and prepare party like it's 1979. Expect to pay $49 for the most unique case you'll ever find to protect your iPad. The overwhelming feelings of peace, love and understanding come free upon delivery. The Incase iPhone 4 Slider Case Has Cometh! The wildly popular Incase Slider has finally made its official debut for iPhone 4. This hardshell plastic case offers users a soft-touch coating along with interior rubber guardrails for shock absorption and scratch protection. Incase has equipped their Slider with a co-molded Flash Ring surrounding the camera cutout, designed to prevent glare interference when snapping photos using the new iPhone 4 flash. The company promises crisp images and unwanted distortion with their Lord of the Flash Ring concept. Anxious hordes of iPhone 4 fanatics can get their hairy man hands on the Black Slider immediately. Expect to pay $34.95 for the slide of your life. Metallic Slider Cases for iPhone 4 come in Gunmetal, Dark Mauve and Raspberry, but those will not be shipping until later in August. I can't wait to take the new Slider case for a hands-on test drive. Black is the new white baby! The Pantless Knights, who brought us the laugh out loud "I'm On A Mac" video have served up another memorable slacker classic with "Sit On My Facebook (Internet Love Song)." Although I can't say this video made me wiki-pee in my pants, it's definitely a perfectly naughty nerd 2.0 anthem for a culture obsessed with Social Networking. STYLE GUIDE: We've been getting loads of emails tipping us on this mysterious white iPhone 4 that's been beautifully designed with the rainbow Apple logo and some kind of magical sheath over the black. The result is a slick and drool-worthy vision in white. Although the retro design is credited to GelaSkins by the photographer, it's nowhere to be found on their website. It's most likely a custom skin job that's about to get wildly popular for those who want more than just black. Unfortunately we don't create epic iPhone 4 geek wear. We just post about it for the entire planet to drool over. Enjoy! Banned iPhone 4 Video Features "The Black Guy"
Another banned iPhone 4 promo video has managed to surface just as Apple has magically made the whole "Antennagate" fiasco disappear into thin air. Well good luck trying to convince the only "black guy" working at Apple headquarters that it's a non issue. Darnell Johnson is not buying it! On Friday, July 30th 17 more countries will get their chance to manhandle Apple's best-selling iPhone 4 device in a choice of black or black. The latest iPhone is currently available in the US, France, Germany, Japan and the UK for a suggested retail price of $199 (US) for the 16GB model and $299 (US) for the 32GB model. If you've already used Apple's iPhone 4 Case Program app to order your free Bumper, then you know that shipping could take 3 to 5 weeks. If you choose black, you can have your freebie shipped in 2 to 4 weeks. We've received dozens of emails confirming the lengthy wait times quoted by Apple for the free antenna fix promised to all iPhone 4 users. During Apple's press conference on July 16th, I ordered a white Bumper so I could ensure receiving the color of my choice before the rush. I planned to get a refund afterward. My white Bumper shipped on July 23rd with an estimated delivery date of July 29th. That's just 13 days since I placed my order. I paid $4.00 for shipping. The Federal Express record shows my Bumper was even shipped from Shenzhen, China. So why are the free cases taking so much longer? Would you be willing to pay $4.00 if you knew your free Bumper would arrive in under two weeks? Given the choice, I would. Artist Chris Bishop has immortalized the war between Apple and Google by creating an ultra-fashionable T-shirt. These epic tees are offered in both men's and woman's sizes or you can just buy a poster if that's more of your thing. Expect to pay $19 for your 100-percent cotton Apple vs. Google T-shirt and the same for an 18 inches x 24 inches, hand-pulled screenprint. The iPhone vs. Android battle has never looked so brilliant. Even if it only wages on inside our own fanboy minds. 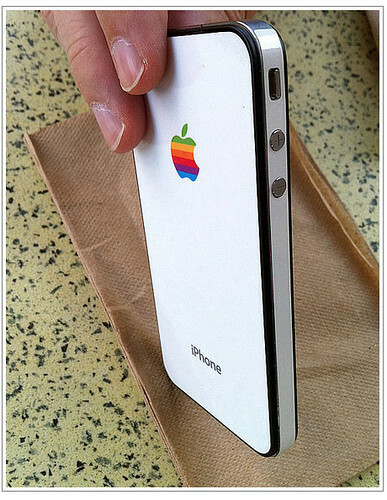 STYLE GUIDE: Here's a simple case solution that delivers a classic white look to your iPhone 4 for under $25. What makes this design so slick, is that Cimo Cases have screen printed the Apple logo and iPhone art onto the back of their hard plastic case, giving your iPhone 4 the feel of authenticity. These protective plastic hard cases (with Apple logo) come in several different colors including the wildly popular black. They snap-on using clear plastic on the sides. 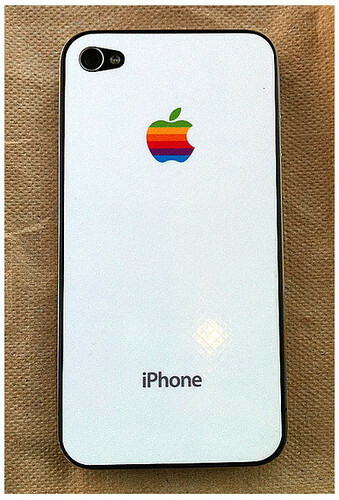 Now just add a white iColorWrap vinyl decal to your blackened iPhone and you'll have that clean, classic Apple glow I keep dreaming about night after night. Expect to pay $9.00 for this great white hope for iPhone 4. The feeling of epic joy comes free with delivery. Apple delivered bad news on Friday, announcing in an official statement that their White iPhone 4 model will be delayed until "later this year". "White models of Apple's new iPhone 4 have continued to be more challenging to manufacture than we originally expected, and as a result they will not be available until later this year." The announcement marks the second failed launch of the wildly popular white model phone since June. Just one week ago, Steve Jobs confirmed at Apple's iPhone 4 press conference that the great White device which has been MIA since the June 24th launch, would start shipping at the end of July. That statement turned out to be completely untrue. In a June press release, Apple admitted that ""White models of Apple's new iPhone 4 have proven more challenging to manufacture than expected." It's possible that the company is choosing to launch the white model with ample quantities later, rather than releasing the device in limited force now. This move would also allow iPhone 4 to have a convenient second coming closer to holiday sales time for the retailer. Maybe the wonky antenna issue will get a bit of a retooling during the extended downtime. But that's just wishful thinking. Regardless of the lame reasons for another painful delay, this news will serve up a huge disappointment for those pinning hopes on a heavy petting session with ol' whitie this summer. 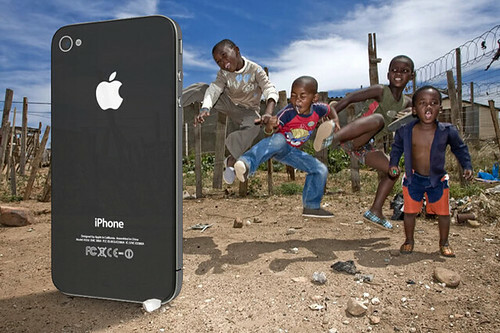 Apple did insure everyone that "The availability of the more popular iPhone 4 black models is not affected." More popular? It's the only freakin option! How can it be "more popular"? Black is the new white. Get used to it.